The description ‘Mother of God’ … is … the fundamental name with which the Community of Believers has always honoured the Blessed Virgin. It clearly explains Mary’s mission in salvation history. All other titles attributed to Our Lady are based on her vocation to be the Mother of the Redeemer, the human creature chosen by God to bring about the plan of salvation, centred on the great mystery of the Incarnation of the Divine Word. Let us us think of the privilege of the ‘Immaculate Conception,’ that is, of Mary being immune to sin from conception: she was preserved from any stain of sin because she was to be the Mother of the Redeemer. 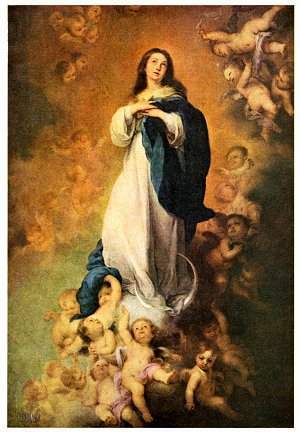 The same applies to the title ‘Our Lady of the Assumption’: the One who had brought forth the Saviour could not be subject to the corruption which derives from original sin. And we know that all these privileges were not granted in order to distance Mary from us but, on the contrary, to bring her close; indeed, since she was totally with God, this woman is very close to us and helps us as a mother and a sister. The unique and unrepeatable position that Mary occupies in the Community of Believers also stems from her fundamental vocation to being the Mother of the Redeemer. Precisely as such, Mary is also the Mother of the Mystical Body of Christ, which is the Church. Everyone loves a party, and that is right and proper, and what more wonderful thing is there to celebrate than a wedding, the joining of a man and a woman that they may become one flesh. Marriage is an image used of Christ and his church: it speaks of a deep union, a profound and meaningful relationship, one of self-giving love, commitment, something wonderful and mysterious. We have not come here this morning to celebrate a wedding but rather the death and resurrection of Jesus Christ, we have come to do what he told his disciples to do at the Last Supper, and the church has done ever since, and will until the end of time. We have come so that we may be fed, be fed by Christ, be fed with Christ, by the power of the Holy Spirit God is active in our lives, transforming us, by his grace, so that our human nature may be transformed, into His Divine nature. If we were to listen to the many voices around us which criticise Christianity, we would think that we were of all people the most pitiable, ours is either a weak death-cult of a failed Jewish magician and wonderworker, or a strange oppressive force which actively works against human flourishing and actualisation. But nothing could be further from the truth, we celebrate love, and forgiveness, we are imbued with faith, hope, and love in and through God at our Baptism, and as our vocation as Christians is JOY. The one whom we worship, the Son of God made flesh liked nothing better than to hang around at parties with social undesirables, and was accused of being a drunkard by religious authorities. Most of us have outside our houses one or two wheelie bins, which are a similar size to the water jars in the Gospel. They hold about 30 gallons, or 150 litres, or 200 bottles of wine. Multiply that by 6 and you’re looking at 1,200 bottles of wine, a hundred cases, and this was after the wine ran out, what we’re dealing with in the wedding at Cana must have been some party, it must have gone of for a couple of days, and it is only a foreshadowing of the joy of the Kingdom, it points to something greater than itself: this is what is in store. Our starting point as Christians is Mary’s advice to the servants: Do whatever He tells you. Our life as Christians is rooted in obedience: we listen to God and we obey, for our own good, and the good of the Kingdom, so that we are not conformed to the world and its ways, but rather to the will of God, so that we can truly enter into the joy of the Lord, in humble obedience, fed by Him, and fed with Him, who died for love of us in obedience to the will of the Father. The world around us struggles somewhat with extravagance, we distrust it, and rightly so: when we see Arabian oil magnates riding around in gold-plated supercars we are right to be concerned, yet in the Gospel we see something strange. The steward had a point: you serve the best wine first, while people are sober and can appreciate it, but the Kingdom of God turns human values on their head – the joyous new wine of the Kingdom is finer than any human wine and is lavished upon undeserving humanity, so that it might transform us, so that we might come to share in the glory of God, and his very nature. Thus, at the Epiphany we celebrate three feasts: Our Lord’s manifestation to the Gentiles, the proclamation of the Messiah to the whole world, his baptism, to show us the way to the Father, a sign of love and obedience, and the Wedding Feast at Cana, as a sign of the superabundance of God’s love, shown to us here today in the Eucharist where we drink the wine of the Kingdom the Blood of Christ so that we may be transformed by the power and the grace of God, so that we may share his Divine life, and encourage others to enter into the joy of the Lord. All this is brought about by Christ on the Cross, where the Lamb of God is sacrificed, a new passover for a new Israel, the people of God, to free us from our sins, and to give us new life in Christ. It’s crazy, it doesn’t make sense: how and why should God love us so much to go far beyond what Abraham did with Isaac on the mountain of Moriah. The ram caught in the thicket points to Christ, who is the Lamb of God, even then, at the beginning God shows us his love for us, he prepares the way, by giving us a sign, to point us to Christ, to his Son. Such generosity is hard to comprehend, it leaves us speechless, and all that we can do is to stand like the Beloved Disciple S. John at the foot of the Cross and marvel at the majesty of God’s love. It affects S. Paul in his preaching, a man who began persecuting the Church, who was present at the martyrdom of S. Stephen, has his life transformed by Christ, through the power of the Holy Spirit, Christ saving us does not make sense, it is an act of reckless generosity, like helping a wedding party drink to the point of excess, it is not supposed to make sense. In rational terms we are sinners, who do not deserve God’s mercy, and yet he shows us his love in giving us his Son, to be born for us, to work signs and wonders, to bring healing and to proclaim the good news of the Kingdom of God’s love, his mercy, and forgiveness. So let us come to him, clinging to His Cross, our ONLY HOPE, let us be fed with him, and by him, to be strengthened, healed, and restored, and to share this is with the world, so that it may believe and give glory to God the Father, God the Son, and God the Holy Spirit, to whom be ascribed as is most right and just, all might, majesty, glory, dominion, and power, now and forever. These words were spoken in 1947, and are as true now as they were when they were first spoken. Fulton Sheen preached the truth which the world still does not wish to hear. What can we do? Love God, and each other, and hold fast to our faith in this time of trial, safe in the knowledge that Christ has conquered sin, evil, and death. Let us be hopeful and confident. People who dislike Marian devotion, because it’s ‘a bit too ‘igh for ‘em’ or ‘it detracts from Jesus’, have got things wrong, and generally they err with how they understand one or all of the three Persons of the Trinity. For the last 1,585 years the Church has referred to Our Lady as the Mother of God, not the Mother of Christ, the Mother of Jesus, or some poor Jewish girl raped by a Roman soldier. The Mother of God, the Theotokos or God-bearer is her title which we celebrate today. The words we use matter. It matters that Mary bears in her womb the Word of God Incarnate, True God and True Man, for our salvation. The poor in spirit are those who are so detached from wealth, from social position, and from earthly knowledge that, at the moment the Kingdom of God demands a sacrifice, they are prepared to surrender all. The world around us tells us constantly that if you want to be happy, to be yourself fully and most really then what you need is more stuff: a new car, a mobile phone. It’s the latest model – it’s been improved, you can’t do without it! The world tells us this and we listen, we take it in and we do what it says. We all of us do this, I’ve done it myself. It says you can have what you want TODAY, we’ll even lend you the money for it and charge you an interest rate which is usurious and wrong. It will make you and your family happy, in a way that nothing else can. Nothing could, in fact, be further from the truth. Salvation by stuff has never and will never work. It leaves us empty, craving more and more, never satisﬁed. Hence Our Lord’s teaching in this morning’s Gospel: ‘Take care, and be on your guard against all covetousness, for one’s life does not consist in the abundance of possessions.’ (Lk 12:15) Wanting more stuff is never a good idea; Our Lord tells us this and warns us against it, and we do not listen. So He tells us a parable – there’s a man who’s got loads of stuff, he’s well-off in worldly terms, he has done well. All he’s interested in is keeping his stuff, building bigger barns into which to put stuff, so that he can sit back, and relax and take life easy. Then he dies, quite suddenly, and learns that important lesson: you can’t take it with you when you go – you can’t put pockets in your shroud, and when you are dead then stuff doesn’t really help you. It may buy you a swankier funeral, a more expensive coffin, a more expensive hearse to transport your dead body, but basically you are dead, and even if you spend thousands of pounds having your head frozen in liquid nitrogen, you are still dead. Money and stuff can’t help you with that. It has never been able to, nor will it. So Our Lord encourages us to be rich towards God, and to turn away from the world and its vanity. This is the life which stores up treasure in heaven, when we have ‘Set our minds on things that are above, not on things that are on earth’ (Col 3:2) This is what a Christian life really looks like, when lived out in the world. This is the sort of radically different life which can and does both change and transform the world: offering it a way that is different to the way of stuff. It is the way of love and forgiveness, of knowing that as Christians that we are loved and forgiven, no matter who we are or what we’ve done. That we can be a community which lives out this radical love and forgiveness in the world to offer it a new way of being, which turns the ways and values of the world on its head. It is that radical, that revolutionary, and that revolution has to start right here and today. We are listening to Our Lord speaking to us through His Scriptures; he calls us to live this life for our own good and the glory of the God who made us, the God who loves us, and the God who saves us: to be free from the tyranny of stuff and sin, and to live for him. This then is what the Church is meant to look like, and be, and live out in the world, like a lamp set upon a lamp stand or a city upon a hill, shining, attractive, a light amidst the darkness of this world, a radical alternative, life in all its fullness. So let’s live it, together. That is why we have come here, today, to be fed in word and sacrament, to be fed by God, to be fed with God, with His Body and Blood and His Word, so that it may nourish us and prepare us for heaven, so that it can transform our human nature and fill us with the Divine life of love and forgiveness, which we can start living out here and now and change all the world, so that it may believe and be transformed to sing the praise of God the Father, God the Son, and God the Holy Spirit, to whom be ascribed as is most right and just all might, majesty, glory, dominion, and power, now and forever. … she is what God wanted us all to be, she speaks of herself as the Eternal blueprint in the Mind of God, the one whom God loved before she was a creature. She is even pictured as being with Him not only at creation but before creation. She existed in the Divine Mind as an Eternal Thought before there were any mothers. She is the Mother of mothers – she is the world’s first love. Assumpta est Maria in Caelum! Wishing you all a happy and joyous feast of Our Lady’s Assumption and begging Her intercession for this land, Her dowry.